SB 50 had its first hearing at the Senate Housing Committee yesterday and passed 9-1. NPH Senior Policy Manager Pedro Galvao testified that this critical bill will protect longtime residents and their communities from displacement, save workers hours of commute time, and create more options for California families to find safe, stable, affordable homes. AB 10 sailed through its first committee with unanimous approval, while ACA 1 also passed through its first committee with a strong 5-2 vote. AB 10 will help California grow our successful Low-Income Housing Tax Credit Program (LIHTC) to ensure more Californians can find safe, stable, affordable places to call home. 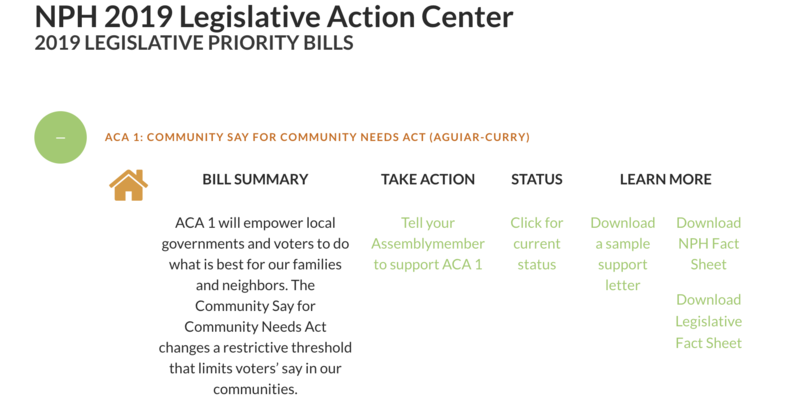 ACA 1, the Community Say for Community Needs Act, will empower local governments and voters to do what is best for our families and neighbors by lowering a restrictive voter threshold from 66.7 to 55 percent. Two NPH priority bills will have their first hearings next week. AB 1486 would strengthen our Surplus Land Act to transform unused public land into a public good — making more public land available for affordable homes and open space. AB 1487 allows the Bay Area to join together to find Bay Area-specific solutions to our region’s housing affordability needs. This bill creates new regional funding and programs to strengthen our region with more affordable homes and protections for longtime residents so that all Bay Area residents, no matter their color or income, have a safe, stable, affordable place to call home. We’ll be updating and adding more information and materials as we progress through the legislative session, so check back often! Celebrate with the NPH community on Thursday, May 2nd as we honor our collective work and accomplishments and recognize the inspiring leaders who strengthen Our Movement, Our Future, including our 2018 Local Campaign Champions; the NPH Founders, our Movement Trailblazers; and Kevin Knudtson, our Lifetime Achievement Awardee. Join us at The City Club of San Francisco for an evening of celebration and community with live music, hors d’oeuvres, and beverages! ​Join NPH’s Emerging Leaders Peer Network (ELPN) at their April 8 "Understanding your Construction Lender" training. This training gives participants access to Q&A with the Silicon Valley Bank team and a developer, and offers an insider’s peek on how credit committees look at deals and why they ask the questions they do of developers and other members of the team. Learn more and register here. 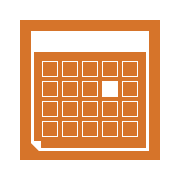 Join the Bay Area Asset Management Group and NPH on April 25th for "Year 15 Exits: How to successfully navigate the exit of a limited partnership." 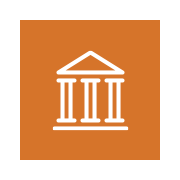 This training is designed to provide an overview into the process of exiting a limited partnership and includes a presentation from Lauren Maddock, California Housing Partnership, followed by a discussion about best practices of the exit process. Learn more and register here. We’re so pleased to announce our newest member of the team. 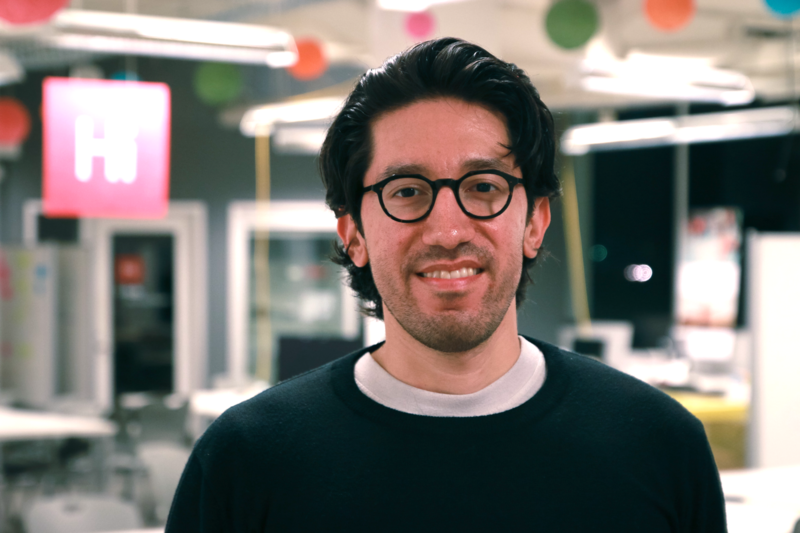 Emmanuel Escamilla joins NPH as a Fund Development Associate, responsible for supporting the strategic coordination and execution of NPH’s fundraising campaigns and membership activities. He comes to NPH with a background managing and scaling an EdTech nonprofit focused on making tech education accessible in rural communities in California’s Central Valley. His interest for entering the affordable housing industry stems from his involvement in developing affordable space-sharing solutions with nonprofit organizations and underutilized religious places. In 2016, he was awarded the Westly Prize for Top Young Innovators in California and in 2018, he was recognized as 20 Under 40 Honoree by the Modesto Bee. Emmanuel holds a bachelor’s degree from the University of California, Berkeley, and a master’s degree from Harvard University. Drop him a line at emmanuel@nonprofithousing.org to say hello, share about your NPH membership experience, and welcome him to our team! NPH will not be publishing a Bulletin on Wednesday, April 17, as NPH staff are honored to be joining with leaders from around the state at the Housing CA Conference from April 15 – 17. Wednesday, April 3: Eden Housing Re-Dedication of Washington Creek Apartments. The City of Petaluma and Eden Housing invite you to the Re-dedication of Washington Creek Apartments, which was rehabbed in October of 2017. The community provides 32 affordable units on 1.7 acres in Petaluma for low-income families and has a remodeled community space, two playgrounds and both 2 and 3 bedroom units. Lunch will be provided. Friday, April 5: MidPen Pippin Orchards Grand Re-Opening. Come celebrate the completion of Pippin Orchards Apartments, 46 affordable apartments for families in Watsonville. Pippin Orchards is the result of a multi-jurisdictional effort to bring much-needed affordable housing to southern Santa Cruz County. Monday – Wednesday, 4/15 – 4/17: NACEDA "People and Places​." Community developers from every corner of the country will convene near Washington, DC for NACEDA’s People & Places 2019. Join them for this dynamic, peer-learning event where you can learn what’s working in low-income neighborhoods and communities of color from the people who make it happen. Together, we will strengthen our skills, unite our networks, and raise our voices for the communities we serve. Tuesday, April 16: National Housing Conference "Solutions for Housing Communications." Join NHC in DC for the only national convening designed for housing communicators. Breakout sessions will address communications tools and trends housing communicators rely on for their day-to-day work. Plenary sessions will feature national experts and engaging topics that will provide helpful tips and strategies on how housing organizations communicate with policymakers, the media, stakeholders and its constituents. Be on the lookout for NPH Communications Director Alina Harway on the morning panel! Wednesday, 4/17: CHP 20th Annual "Night with the Stars." For twenty years, A Night with the Stars has been one of San Francisco’s premier fundraising events, showcasing the talent of some very special performers — Community Housing Partnership’s residents — who have overcome homelessness and built a foundation for success. The event, attended by San Franciscans from across the spectrum of sectors, is a truly unique celebration of our community. During this year’s event, guests will enjoy a wide variety of cuisines, an open bar, and exclusive performances — all in the San Francisco War Memorial’s stunning Green Room, overlooking City Hall. Friday, 4/19: First Community Housing N San Pedro Apartments Groundbreaking. Join First Community Housing to celebrate breaking ground on this momentous project to house 134 veterans, homeless, and low-income families at North San Pedro Apartments. There will be refreshments, ceremonial golden-shovel festivities, and a few words from leaders that helped make this project possible, including Senator Jim Beall and Mayor Sam Liccardo. Friday, 5/3: SV@Home Policy Luncheon. Join SV@Home to kick off Affordable Housing Month festivities in Santa Clara County. This luncheon will feature a lively discussion outlining the impact that housing affordability crisis has had on innovation, highlighting commitments that have been made, sharing ideas for how companies of all sizes can play a transformative role, and engaging new perspectives on which policies or programs are working (and which aren’t) to better unleash the creative energy of the Valley in addressing our shared responsibility to our communities. Friday, 5/3: CCHO Annual Party. Join CCHO to kick off Affordable Housing Month festivities in San Francisco and celebrate this long history, our collective work, and our future! Join us for an evening of food, camaraderie, history, and the CCHO Housing Awards honoring our allies in the fight for a City for All! Wednesday, 5/8: EBHO 35th Anniversary Affordable Housing Week Kick-Off! Join EBHO to kick off Affordable Housing Month festivities in East Bay and enjoy an evening of unbeatable fun, delicious food, festive music, and a celebration of our collective work for affordable homes! 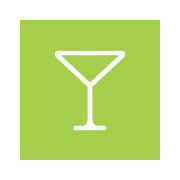 Friday, 5/10: HLC 2019 Policy Mixer. Join Housing Leadership Council to kick off Affordable Housing Month festivities in San Mateo County by eating, drinking, networking, and discussing opportunities to mobilize our communities to be champions for housing. We’ll reflect on all of the fantastic work we at HLC and our partners are doing to tackle the housing shortage. Thank you for your support for affordable housing. Together, we can build a future where everyone has access to a safe, healthy, affordable home!